way for a riveting day on the Yorkshire coastlines. 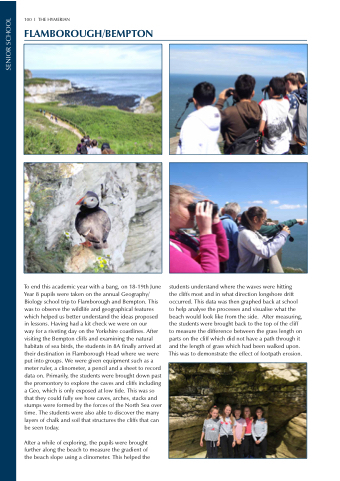 After visiting the Bempton cliffs and examining the natural habitats of sea birds, the students in 8A finally arrived at their destination in Flamborough Head where we were put into groups. We were given equipment such as a meter ruler, a clinometer, a pencil and a sheet to record data on. Primarily, the students were brought down past the promontory to explore the caves and cliffs including a Geo, which is only exposed at low tide. This was so that they could fully see how caves, arches, stacks and stumps were formed by the forces of the North Sea over time. The students were also able to discover the many layers of chalk and soil that structures the cliffs that can be seen today. the cliffs most and in what direction longshore drift occurred. This data was then graphed back at school to help analyse the processes and visualise what the beach would look like from the side. After measuring, the students were brought back to the top of the cliff to measure the difference between the grass length on parts on the cliff which did not have a path through it and the length of grass which had been walked upon. This was to demonstrate the effect of footpath erosion.